You are here: Home / Topics / Build More Power / Babe Ruth Reveals Hand Tension? True OR False: "If you think science is fact you're horribly mistaken"
Thanks for explaining the method of hand tension, I understand it now. You also had a much less racing back elbow with hand tension too! Joey…. another great analysis! Each one of the experiments you do shows and proves that the arm don’t add to the power of the swing in any way. The arms and hands only goal should be to fight the inertia of the bat. The bat weighs so much and the arms are a weak link. 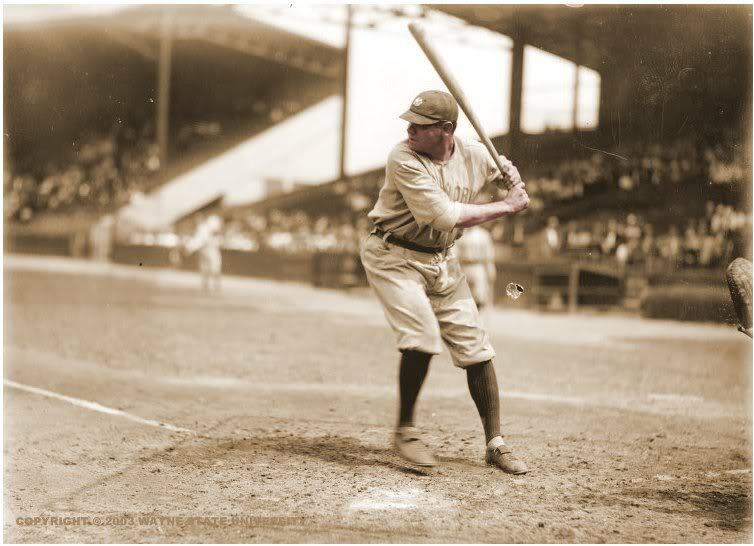 In most cases, players with a loosey-goosey approach to hitting are missing the connection needed to accelerate the bat so it keeps up with the turn of The torso. Also, arm motions that are circular in the stance. Opening and closing the hands… anything that does not promote connection of the bat from the very first initiation of the swing is a power leak. Start with connection and use connection. It is more of an efficient mechanic and you can loosen everything up to slow the bat down if need be when fooled. These great hitters have both hands and arms fighting each other. The opposite is to have no fight at all and the barrel never keeps up with the turning shoulders. Bat drag in worst case scenario. Once again you are proving what the best hitters do. They probably don’t know what they do, but they do do this. Arms have to fight and the hands have to fight or no connection /acceleration. If everything is loose, nothing accelerates. Also… when the 90 degree (+/-) hinge angle between the lead forearm and the bat is releasing, the hands break the angle and the hands fighting is over. Then the barrel freewheels in the circular hand path. Some people might think the fight of the hands breaking the handle is all the way into impact by mistake. This hinge angle opens on its own and is not assisted by the arms or hands at all. Kyle … I’m having trouble connecting the dots using your explanation of this experiment, and following the reasoning of your comments. What I’m getting out of what you’re saying falls under the heading of ‘Circular Reasoning’, and you are making assumptions and drawing conclusions that frankly don’t fit the guidelines for scientific evaluation. You are suggesting that because there was a difference in bat speeds with the tight grip as opposed to a loose grip, that it proves conclusively that the hands and arms do nothing to provide force to the swing. To my way of thinking … the opposite is true, based on these findings. If there was no change in speeds, you may be able to say the hands had no bearing on the outcome. Observing the fact that there was a SIGNIFICANT difference in bat speed from one grip to the next, and the test was done with enough swings to get a good sample, my conclusions would be that the hands have a SIGNIFICANT impact on bat speed – because that is what the test was about, and that’s what the data revealed. If, for example, the loose grip swing registered the same speed, but there was a loss of control in terms of contacting the ball, then it would be within reason to conclude that having a loose grip would result in a lose of bat control – but there is no way one can say the results of this test show what you are saying they show. Bob, I think what Kyle is stressing is connection. Check out the Tim Ferriss and Pavel podcast on strength. It’s a real eye opener on how the hands have the ability to link the mid section. It’s “educating the hands” as Homer Kelly calls it. I like the questions…we’re all knowledgeable people on the subject. Push each other and the truth comes out. Love the thoughts guys! To clarify, when I say the arms and hands don’t add any power to the swing, I meant they are a linkage to transfer energy. It can be a loosely bolted down linkage, or a tightly connected locked down linkage. By keeping it tightly locked down(fight position), you can accelerate the barrel efficiently. Many people believe the arms and hands move to the ball in a linear way or there is a soft, loose, whippy action to the swing. The hands in the fight position don’t really move at all in relation to the torso/spine. Any pushing of the hands towards the ball decelerates the barrel. I understand that the arms and hands, and they way they are used, can accelerate the barrel or not accelerate the barrel in an efficient way. The arms and hands are fighting to not move from their position in relation to the torso. If the torso turns, and the arms and hands are not locked into this set geometry, the torso is turning, but the barrel is not accelerating anywhere. I think i could have said it better… For years I have been a long time proponent of the “fight” aspect of swinging a bat. I believe that if you try to accelerate the bat with the hands moving out of the geometry, you are slowing the swing down. 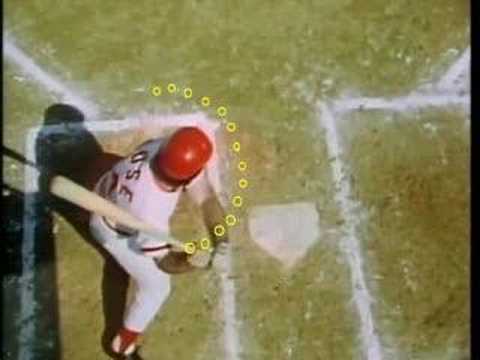 Here are some overhead pics of Pete Rose showing that the hands don’t move forward in relation to the spine. They will after impact though to decelerate the bat. Also on outside pitches they will move out away from the body sooner. I’m following but not completely. You mention pre-turn hand tension but I assume that the tension is released with the turn and the swing? Stuart McGill’s research which states that elite athletes pulse strength or tension at the time of impact in contact sports do you believe that also rings true in hitting too? Andrew, yes the hand-tension is released at the turn. It’s to keep the hands and arms connected to the core pre-turn. I’ll have to check out Stuart McGill’s research. Sounds interesting. Looks like I’m uncertain what you mean exactly Kyle when you say ‘staying connected’. Does that just mean executing the proper sequence in time, and does being ‘disconnected’ mean you are out of synch? A loss of power/speed can come from a leak, or simply not being able to manufacture it in the first place – which is an issue of applied force. Jeffs comment of a racing back elbow can be explained in two ways … 1) the player starts the elbow but doesn’t take the bat with it – therfore the dragging bat … and 2) the bat is starting from too far away and has too far to travel to the point of contact and therefore is behind the rest of the swing. Joey mentioned that when he talked about the bat angle at launch in the posting with young Stephan. Anyway … always great to read your comments boys … thanks. I was all set to say, “Aha, GOTCHA!” based on the set up (order of tension/no tension) and lower numbers due to the onset of fatigue. But alas I cannot due to the fact that you went WITH tension for the FIRST 100 swings. Purposeful?? Hand tension = hand torque? Maybe. The main thing is to have – as Kyle says – the hands/arms fighting each other pre-turn. Was trying to explain that the arms and hands are the linkage to the torso/spine turning. If they are soft/loose the connection to the turn is not transferred to the bat properly. And where else in a baseball thread are you going to find references to Pavel?! Love the athletic cross-referencing we see from Joey. I read Pavel’s “Power to the People” about 5 years ago and thought is was fantastic. Use his workout technique to this day. Kyle … I looked at those pictures, and frankly I’m not sure what exactly you’re looking at. In picture 1 we’ll call it (the one where he’s in his stance pre-launch) his hands are at least 14 inches dorsal to the sagittal plane, and in picture 2 (where he’s about to extend his back arm to contact) he’s still a good two feet away from contact and his hands have moved ventral and are almost in line with the sagittal plane. I assume by the point of contact his back arm will have moved closer to straight, and his hands will be ventral (or at least even) to his mid line. To me, this indicates a forward movement of the arms in the range of 14 to 16 inches. Thanks for the pictures. I am/was a big Rose fan. Funny … but isn’t it odd how we (and I don’t mean you or I) hold athletes to a higher moral standard than even the highest ranking politicians? We’ve got a mayor in Toronto (the fourth largest city in North America behind only Mexico City, New York, and LA) doing crack and drunk driving and all this stuff, and he doesn’t lose his job over it. But if an athlete takes a cold pill … get the rope and find the nearest tree. Bob…. to your point. When I talk about the hands not moving forward, I’m speaking about their relationship to the spine or back shoulder. The hands may lower slightly slotting, but they will not move away from that locked in position on a hitters best swing. They will move away from their position in front of the back shoulder when the hinge angle breaks. On the Pete Rose clip, his hands stay in line with his back shoulder. The handle and bat have moved forward because of shoulder rotation. 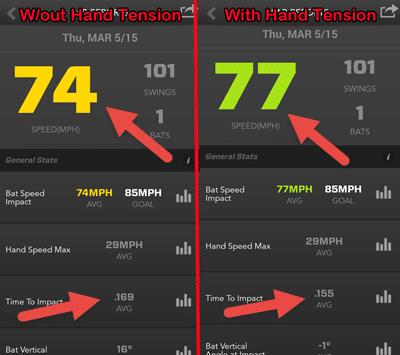 In other words, the hands are not moving more forward as the swing progresses ….the shoulders are just opening. I think our differences come from the fact that I am speaking of these movements in relation to his spine and you are looking at it as if I am speaking that the hands don’t move forward at all (literally). Rose has broke the 90 degree hinge angle in the second pic, but his hands still remain in front of his back shoulder. Joey, how could we rule out the batting gloves from the video adding to your results? It seems that would add another variable to account for the added hitting performance, or would it? What happens to the alignment of the hands (specifically the knuckles) during and post contact? I’m a Collegiate player who has been changed by coaches to have his “knocking knuckles” aligned, which ended up giving me a casting, whippy swing as well as barring me of my power. When I try to go back to a more traditional box grip such as the one used in your video, I notice that no matter what, by the end of my swing my knuckles are once again lined up in the “knocking knuckles” grip. Thoughts? thanks! Steve, door knocking knuckles aren’t a great way to teach grip because every hitter’s hands are different sizes. Line the handle up at the base of the fingers and at the top of the meat of the hand. Basically the middle of the hand. Whatever knuckles line up, or don’t line up, is fine. Whether we’re talking a 7yo or 21yo, this works. My knuckles don’t line up. My top hand door knockers are actually in-between my big and door knockers of my bottom hand. This more natural grip should end up correct at swing finish. Does that answer your question? To Kyle and bob, I think it’s more about taking the slack out of the system. The less slack, the quicker the bat can accelerate in the turn. The more rigid at contact, the more energy is transferred from the hitter’s mass through FoMo and turn. This is what allows smaller guys to swing with the big boys. You’re right on Coach James! Finger pressure connects (w/ springy fascia) what is in the hand to the fascial lines in the torso. 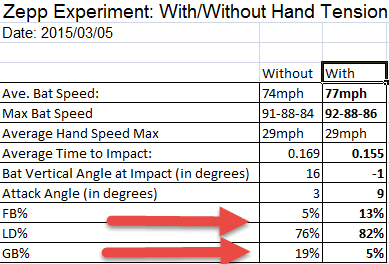 This is why stubborn racing back elbow bat drag disappears with this, at least it has with my hitters. I tried EVERYTHING with a 16yo hitter of mine for over 2 years, and we FINALLY said goodbye to his bat drag within one or two half hour sessions using finger pressure. And keeping finger pressure through impact is critical because we NEED the compression signal of the ball hitting the bat to “feel” like it’s hitting a cinder block, and not a wet pool noodle. The skeleton MUST absorb that compression signal, otherwise with “loose hands” we might as well be swinging a wet newspaper because the compression signal gets lost in the soft (fast/slow twitch muscle fibers) and connective tissues of the body. 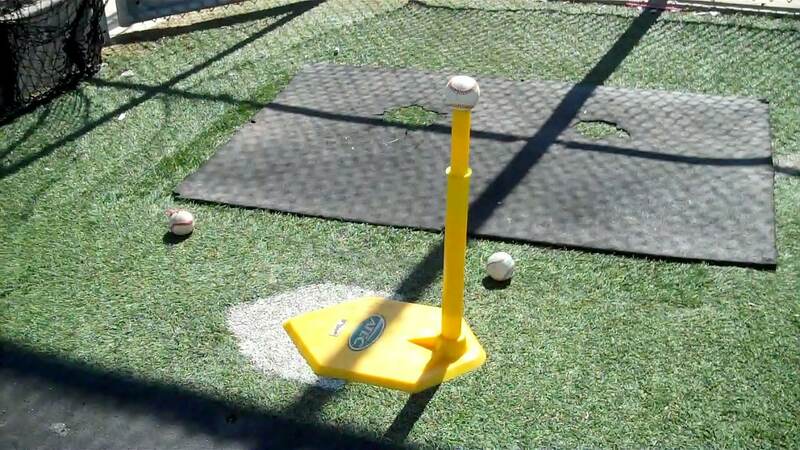 This is how our sub-100 pound hitters can CRUSH the ball over 300-feet, consistently. They’re swinging smarter…AND safer. I have a question: In demonstrating the pre-turn hand tension, you say that the top hand is pushing forward while the bottom hand is pushing backward. Is that because of the angle in which you have the bat, the barrel tilting over your head a bit, a la Miguel Cabrera? Would the hand tension be different – top hand working down the handle while the bottom hand is working up – if you had the bat more straight in the position, more perpendicular to the ground? Would the hand tension be different if that bat was positioned more vertical, more perpendicular to the ground, pre-turn – top hand working down and the bottom hand working up? Joe, good questions…when I did this swing experiment I hadn’t distilled the technique down to top hand bottom three finger pressure yet. However, I simplified this post’s technique to “breaking the handle between the hands”. Sorry, didn’t mean to ask the question twice. First one, thought it didn’t load. Kind of feel that I’m right about the bat in the more vertical position. In “the final turn” the last three fingers of the top hand would be pulling down whereas fron hand pulling forward against knob and up, getting the bat on pitch plane. It’s worth a swing experiment Joe!